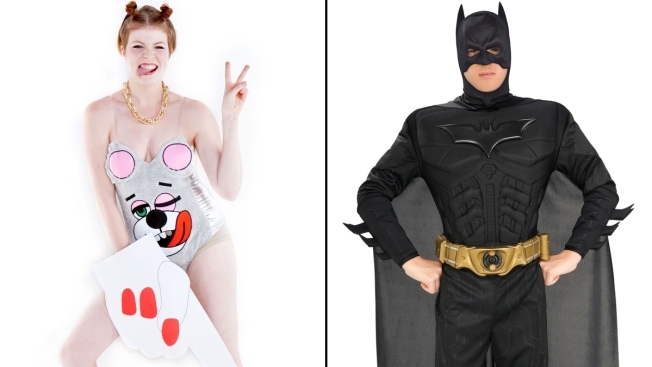 Miley Cyrus and Batman are some of this year's favorites for Halloween costumes. There will be no shortage of witches and Batmans roaming the streets on Halloween this year, but scandal-prone politicians and funny internet memes are sure to give trick-or-treaters inspiration for this year's costumes. More than 5 million, or 10 percent of adults, plan on dressing up as a witch and 2.9 million will dress as Batman, according to the National Retail Federation. But while many are reaching for traditional getups, there are signs that revelers are getting more creative with their costumes. "One exciting trend that has been growing exponentially over the past few years is Do-It-Yourself Costumes," according to Lorne Lucree, Ricky’s Product Development Director. "This allows partiers to truly be whoever they want to be for Halloween." This means Batmans and vampires will celebrate alongside iPhone's Siri, Harlem Shakers and Grumpy Cat. But if scary costumes or internet memes aren't your thing, there is always a new crop of musicians, celebrities and scandlous politicians to impersonate each year. Carlos Danger, anyone? "Miley Cyrus' and Robin Thicke’s performance at the MTV Video Music Awards is sure to inspire some costume ideas," Lucree said. "Amanda Bynes’ many different appearances walking into a courtroom is also expected to be a big hit." Some of Ricky's top costumes this year are the Dirty Cop, Cougar Cat and Pochahantas, Lucree said. For those in need of some help with their DIY costume, Ricky's concierge service promises to help customers create the perfect look. Buzzfeed rounded up a list of DIY costumes with links and instruction on how to dress up like baby North West, the Ikea monkey and a shark from "Sharknado." Huffington Post put together a list that "screams 2013." Wendy Davis with her pink running shoes, Edward Snowden and the Royal Family all made the cut. The NRF also noted that more partiers will look to Pinterest for costume ideas this year. A quick search of "DIY Halloween costumes" on the photo sharing site results in a range of costumes suitable for any budget. In total, Americans will spend $2.6 billion on costumes with $1 billion on children's costumes, $1.2 billion on adult costumes and $330 million on costumes for pets, according to the NRF. Princess, animal and Batman are the top three choices for kids, while pet owners say the top costumes for their furry friends are pumpkin and hot dog with the devil and cat tied at third.